Red Bull driver Max Verstappen turned on his rivals with a foul-mouthed radio blast during the session. The 21-year-old Dutchman was unable to set a final lap after he failed to cross the line in sufficient time. As he prepared for his last shot at improving his grid position, he was passed by Vettel, Ricciardo and Nico Hulkenberg. After being urged to speed up by his race engineer Gianpiero Lambiase, Verstappen yelled over the team radio: "F---, I’m finished mate. They are such w---ers, honestly. "Everybody just lining up and they are just f---ing it up. You’re just trying to be nice, but everybody’s just f---ing it up." Later, speaking to Dutch TV, Verstappen claimed drivers should not overtake one another as they gear up for their speedy laps. He also vowed to gain revenge the next time he qualifies for a race. "On the final run in Q3 I followed the Ferrari in front of me as we were all in a queue. I was actually trying to be nice and not overtake, as that’s not what you do in qualifying when you’re all trying to prepare for the last run. This time it caught me out when I was overtaken at the end of the lap," Verstappen said in a Red Bull Racing statement. "I am of course not happy with that, or to be fifth, but we didn’t get the opportunity to do a final lap. I’m sure this will swing around and happen to other people at another time but it’s annoying as we were fighting for third. "Of course, when you can’t do the last lap in Q3 you know the guys who are doing the lap have a chance of overtaking you and that’s what happened. Team boss Christian Horner also later explained the Dutch driver's frustration. "Max got himself into a good position between the two Ferraris for the final run but unfortunately as things got backed up at the last hairpin, he was passed by Sebastian," Horner said. "He then tried to make a gap to Seb and was passed by both Renaults. By that time he had lost sufficient time that he missed the cut-off and was first to see the chequered flag. "Unfortunately, that concertina also hampered Pierre, resulting in both cars missing the final run. The gap to the front runners is significantly smaller than it was in Bahrain and we can have a strong race from here. "It’s encouraging to have both cars on the third row, particularly for Pierre who equals his best F1 qualifying position but frustrating that we couldn’t fight for third. With both cars having progressed through to Q3, Max and Pierre set the fourth and sixth fastest times respectively after their first run." 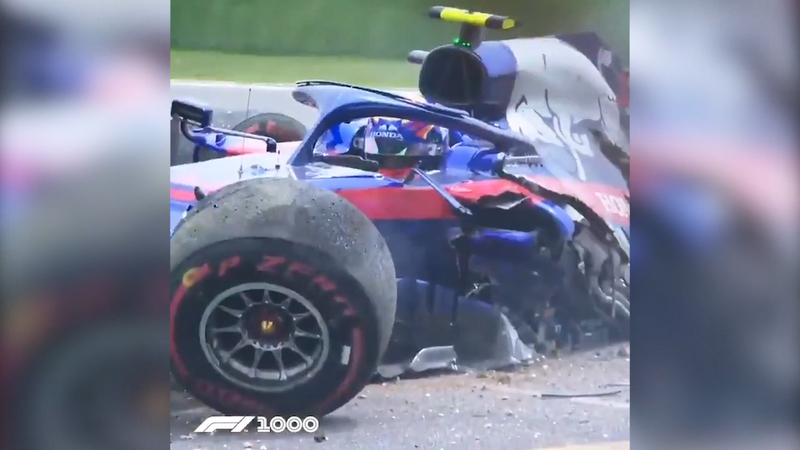 Qualifying featured only 19 cars because Alexander Albon's Toro Rosso could not be repaired in time after the Thai driver had a heavy practice crash. He walked away unharmed but will start at the back. Valtteri Bottas has claimed pole position ahead of team-mate Lewis Hamilton at the Chinese Grand Prix with Mercedes ruling qualifying for the 1000th Formula One race. Bottas, who is championship leader, recorded 1 minute 31.547 seconds around the 5.451-kilometre Shanghai International Circuit on Saturday for his first pole of the season and seventh overall. "It has been a good weekend so far," he said. "I struggled to get the perfect lap in but it was good enough." Title holder Hamilton was 23 hundredths of a second back while Ferrari's Sebastian Vettel was three-tenths behind in third and his team-mate Charles Leclerc fourth on Sunday's grid. Australia's Daniel Ricciardo will line up in seventh spot behind Red Bull pair Verstappen (5th) and Pierre Gasly (6th), his Renault 1.4s slower than Bottas. "I didn't give up and kept pushing right to the end," Hamilton said. "Valtteri has been stellar all weekend. I have struggled. There is time left on the table but I will try and get it back tomorrow."